Ladies Night is special, for more than just a reason. Amidst the insecure vibes of this city, all girls deserve to have some fun, don’t they? With this thought in mind, most of the clubs, bars, lounges, pubs etc. host ladies night to celebrate womanhood, and invite all the gorgeous ladies of Delhi NCR to party at their venue fearlessly. Even though there are many party hubs in Delhi NCR but only a few of them has successfully captured the heart of party lovers. Sector 29 market is one such party destination in Gurgaon which is absolutely amazing when it comes to nightlife parties. 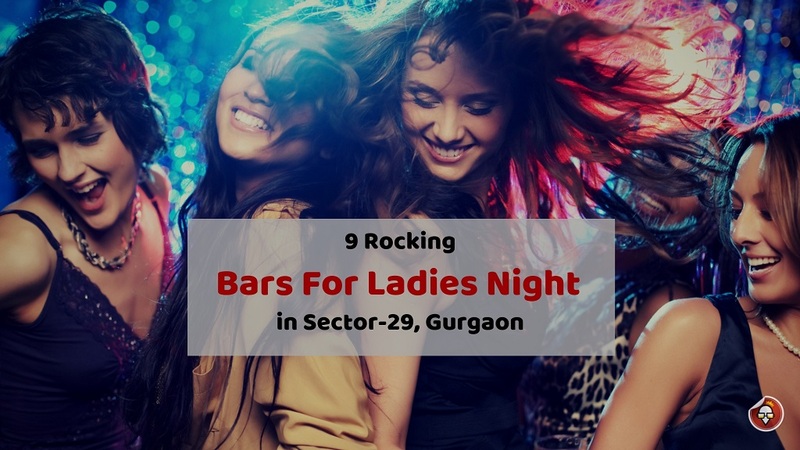 Explore the glitz and glam of bars in Sector 29, Gurgaon with your girl gang, and enjoy ladies night at one of the most amazing nightlife restaurants in Gurgaon. Free drinks and pulsating music can make your boring week super-duper awesome! Doesn’t all this tempt you to wear your favourite dress and party with your girlfriends? If you are the ‘look first- act second’ kind of person so we guess you’d like to know about the deals first? No worries, our list of top 10 bars for the ladies night in Sector-29, Gurgaon will surely convince you to drop everything else and party with your lovelies at these mind-boggling bars. This place is one of the best ladies night venues in Sector in Sector-29, Gurgaon. On Tuesdays, Gravity Spacebar celebrates Astro Ladies Night all day long, where you can enjoy free unlimited drinks with your girl gang. Isn’t that awesome? So, bring in all your girls and groove to the beat of the trippy music while leisurely spending quality time with your lovelies! Who needs a special occasion to party, when you can simply hang-out with your girls to celebrate Diva’s Night at The Hook on every Tuesday? Enjoy unlimited Caprioska, Cosmopolitan, and Apple Martini on the house at Gurgaon Sector-29’s one of the best microbreweries. So, wear that little black dress on, and head to The Hook with your girls for a rocking Tuesday night party! Book your Tuesdays for Molecule Air Bar from now on! Why? Because Molecule’s Ladies night is the best Ladies night in Sector-29, Gurgaon! Enjoy their cocktails, and freshly brewed beer absolutely free of cost with your girl gang. Not just that party there with your girls, and walk out with some exciting giveaways in your hand. So, what are you all waiting for? Wear your party dress, and head to Molecule to celebrate a lovely Tuesdays. Are you craving for lip-smacking cocktails? Call your girlfriends, and gather up at Walking Street by Soi7 to celebrate womanhood. Walking Street host ladies night on every Wednesday 8 PM onwards, where you and your girls can enjoy unlimited cocktails and mocktails on the house. So, what are you waiting for? Say goodbye to the mid-week blues and spend an eventful Wednesday night with your gang! Find delicious drinks here with live band performances to make you groove. Serving North India, Chinese cuisine and a range of finger food, they offer freshly home brewed beer, crazy cocktail mixes and refreshing mocktails, every drink on the house for ladies! Gurgaon Sector- 29’s biggest club Big Boyz Lounge is calling out to all the pretty ladies with their girl gang and offering them unlimited drinks on the house. So, what’s holding you back? Make your Wednesdays merrier with Big Boyz Lounge and beat the mid-week blues with your girls. All the booze lover bold ladies out there! Head to Chull every Thursday for its bindass Ladies Night, and devour lip-smacking drinks (on the house for ladies). Get drunk and groove to the crazy beats of DJ Mudit. Free alcohol, great music, and a company of your gorgeous girlfriends, sounds like a solid fun filled plan, right? Rejoice, ladies! You can enjoy unlimited spirits at Brew Buddy on every Thursday 8 PM onwards. Ladies night was never this much fun. So, stop wasting your Thursdays away, and head to Brew Buddy for a rocking party with your lovelies. Hey Gorgeous! What’s your plan for this Thursday? How about hanging out with your girls and enjoy free drinks at Agent Jack’s Bidding Bar? Yup! That’s right. Agent Jack’s Bidding Bar has made the boring Thursdays ‘Oh so fun’ with its free drinks and groovy music. So, what do you think about spending your Thursday night at Agent Jack’s Bidding Bar with your girls? Make your Sunday night merrier with Feel ALIVE’s Ladies Night. Feel alive at Feel ALIVE with unlimited drinks on the house for all the ladies. With your Sundays sorted all you need to do is, call your girls and wear your favourite dress with red high heels and you are all set for having kickass Sunday party. So, this was a small list of best ladies night in Sector-29, Gurgaon where you can bindass party with your girlfriends. Devour lip-smacking cocktails, mocktails, freshly brewed beers etc. at one these bars that too absolutely free of cost. Sounds tempting, right? This entry was posted in Ladies Night Parties and tagged ladies night, ladies night in gurgaon, ladies night in sector 29. Bookmark the permalink.